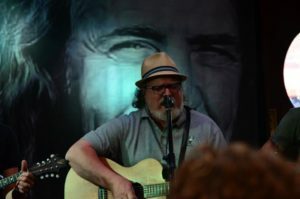 Rick Reiley, essayist, songwriter, is from Cushing, Oklahoma, where he co-hosts the Tuesday Night Music Club with D’Jeanne Duncan and Gene Collier. He has two albums to his credit, ‘Unwashed, Unplugged, Unrehearsed,’ 2002, and ‘Mud and Bone’, 2011. He has attended every Woody Festival since it’s inception (he thinks) and has performed here since 2014.